The X Factor judge swapped her chair for the stage as she transformed into Hollywood's most famous icon. 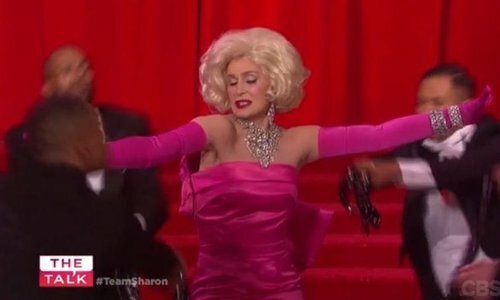 Sharon Osbourne may be used to critiquing performers in her role on 'The X Factor' but she found herself taking centre stage when she channelled Marilyn Monroe for a hilarious performance. Dressed in a blonde wig and a pink ball gown, Mrs.O looked barely unrecognisable as she transformed into the late Hollywood star to perform 'Diamonds Are A Girl's best Friend' from the 1953 movie, 'Gentlemen Prefer Blondes'. Flanked by a string of handsome fellows who were suited and booted just like the classic scene featuring Marilyn's character Lorelei Lee. 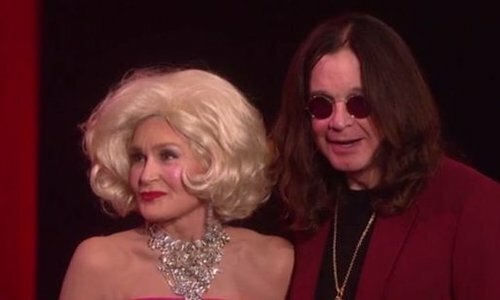 Of course, the 63-year-old isn't looking to have a career change anytime soon, and her tongue-in-cheek performance was simply in aid of Rocktober Lip Sync War. Asked about her favourite part about being Marilyn, Sharon said she adores getting to try out the star's luscious locks.